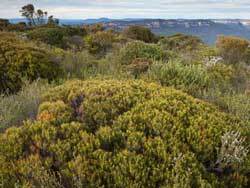 The heathlands of the Greater Blue Mountains are tough-leaved, shrubby plant communities that survive on exposed ridge tops in shallow, nutrient-poor soils. In these harsh conditions the sclerophyllous traits of plants are highly developed. Complex ecological relationships between the heathland plants, fauna and fire, and their scattered distribution in the landscape, have led to high biodiversity. 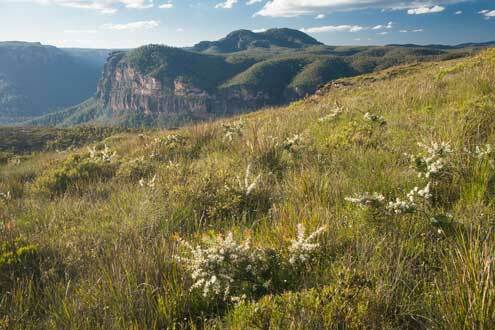 Heathlands are shrubby, largely treeless communities that occur in just under 2% of the Greater Blue Mountains. They are restricted to shallow, nutrient-poor, sandy soils on rock benches in exposed situations, usually ridge tops. They merge into dry sclerophyll forests in less exposed situations with deeper soil and into upland swamps where moisture is greater. 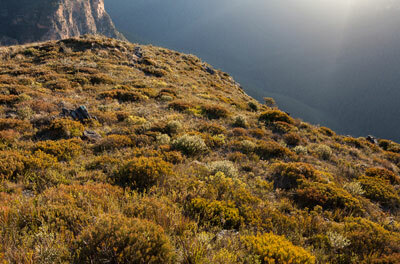 Two classes of heathlands occur in the Greater Blue Mountains, with altitude being the determining factor for which occurs where. 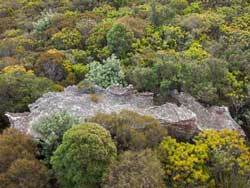 Sydney Coastal Heaths occur on the lower sandstone plateaux in the eastern part of the Greater Blue Mountains (as well as nearer the coast around Sydney), where they occupy shallow, moderately damp soils, mainly on ridge tops. 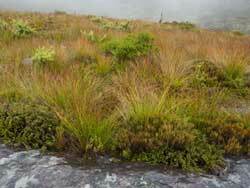 They contain a rich array of sclerophyllous shrubs and an equally rich complement of sedges and herbs. Many patches are relatively small (on average, 4 hectares), and occur on and around rock platforms on exposed sandstone ridge tops jutting above the forests. 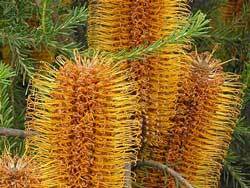 They occur mainly in Blue Mountains, Nattai and southern Wollemi national parks, and less commonly in Yengo National Park, probably due to conditions there being drier. Sydney Montane Heaths replace the coastal heaths above altitudes of about 600 m.
In the Greater Blue Mountains, they are far more extensive, occurring in scattered locations across the high plateaux from western Wollemi through to the tablelands of Kanangra-Boyd National Park. They are prominent on the panoramic ridges of the upper mountains as well as on the spectacular pagodas of Gardens of Stone and western Wollemi. Patches of these heathlands are often small, averaging 3 hectares, although there is considerable variation above and below this size. Genowlan Point Allocasuarina nana Heathland (endangered) occurs only within Mugii Murrum-ban State Conservation Area. A dense shrub to small tree; it has orange candle like cones in Autumn. Its 10-15mm long rosemary like leaves identify it. Also called Needlebush, it is arguably the most prickly customer in the bush. Its leaves are hard and sharp. 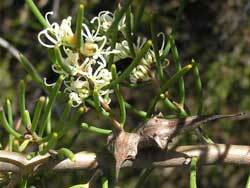 It's named after its distinctively shaped fruit and has white flowers in summer. Flowering in winter and spring, this hardy plant grows in some of the most exposed terrain possible. 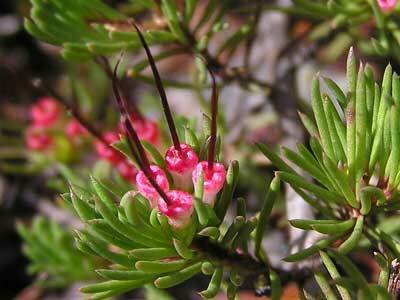 Darwinia species are endemic to Australia and are named after Erasmus Darwin - Charles Darwin's grandfather. A damp version of Sydney Montane Heath on Mt Hay Range, with Allocasuarina nana, Darwinia fascicularis and Actinotus minor in the foreground. The species composition of these heaths varies with site moisture and time since fire. Heathlands are some of the most species-diverse plant communities in the region. Mature heaths are relatively scarce in the upper Blue Mountains, and a bit scarcer since this stand was burnt in about 2015. It is now an interesting site of heath succession, as young plants grow amongst the blackened skeletons.